We need Karma-Yogis to make the festival run smoothly! If you come as a Karma yogi you help one shift during the weekend. Your task will mainly be helping the chefs with the preparation of the food, doing the dishes, and some small cleaning tasks. It will be a shift of about six hours from either early morning to lunch or from lunch until after the dinner clean-up. 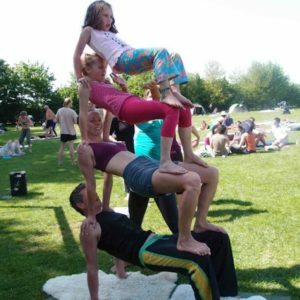 In exchange you get your ticket a little cheaper ánd you get a lot of gratitude from the hungry AcroYogi’s! If you feel like contributing, please buy the Karma-yogi ticket, we really appreciate your help!! All workshops, except for the half a day that you are helping out.